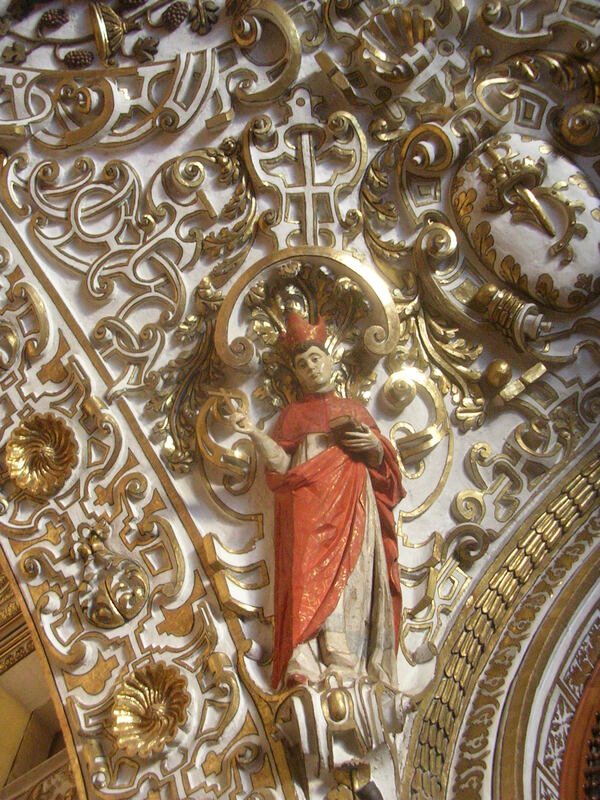 Gold-dipped churches – the Dominicans left a trail of marvellous churches, full of exquisite carvings, high pillars reaching to the sky, the smell of wood and flowers permeating the air. Everything smells like chocolate!!! 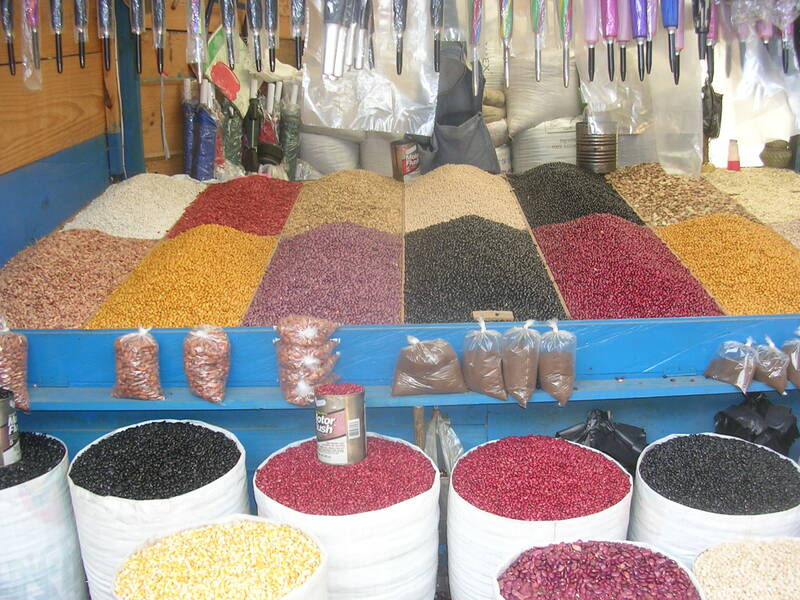 It is freshly ground for making hot chocolate and mole (a yummy sauce used in many of their regional dishes) Mmmmmm…. Traffic – I didn’t see one speck of courtesy in the drivers here. They disobey all the rules. They really do get their driver’s licenses by means that do not include a test! A bus came within an inch of crushing me – the driver decided to turn right – right on top of me. My first reaction was to shake my fist and swear at him. So now he speaks some English! 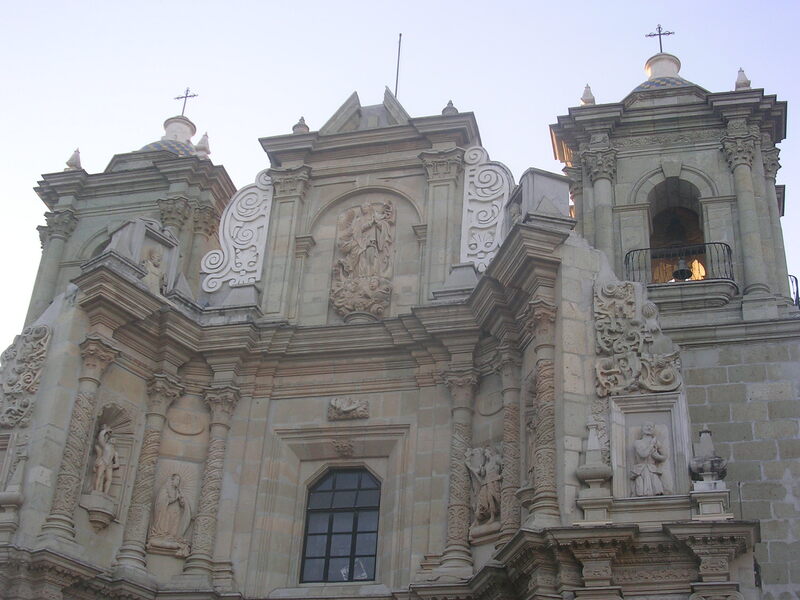 The city is predominately Spanish, with incredible colonial architecture. But it seems to be almost devoid of Indigenous culture. After experiencing Chiapas, I expected a similar mixture of cultures here. 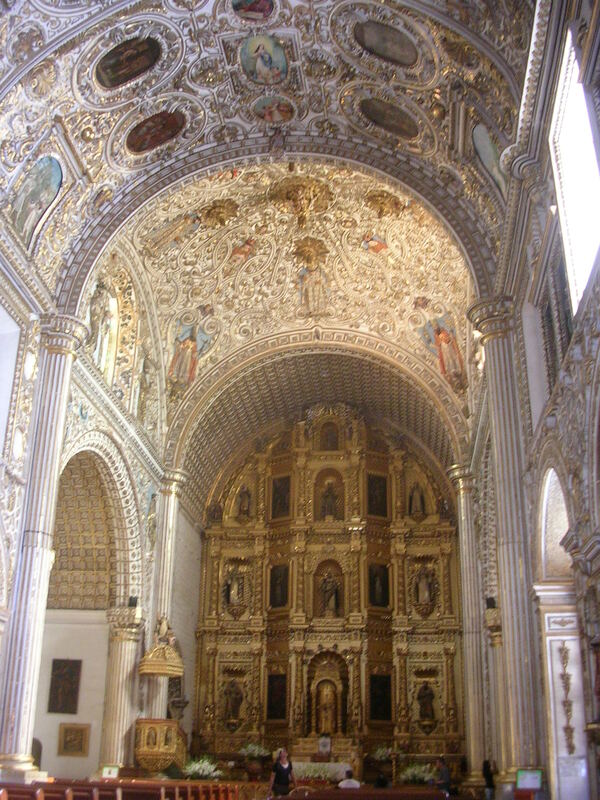 I thought I would hear the many dialects that are still used, see traditional hand woven and embroidered clothing, and learn a bit about the Zapatecas, the pre-Hispanic culture that lived around here. But no. Instead of being a multicultural mix of people here, the Indigenous people still live in the surrounding small towns, in poverty. Noise – wow, I sometimes I think everyone is deaf except me! Loud speakers blaring everywhere, people yelling, dogs barking, horns tooting and tooting… It makes me cranky! The people are friendly and eager to converse. But we really didn’t see any evidence of cultural events. No concerts, dances, art shows… nothing. 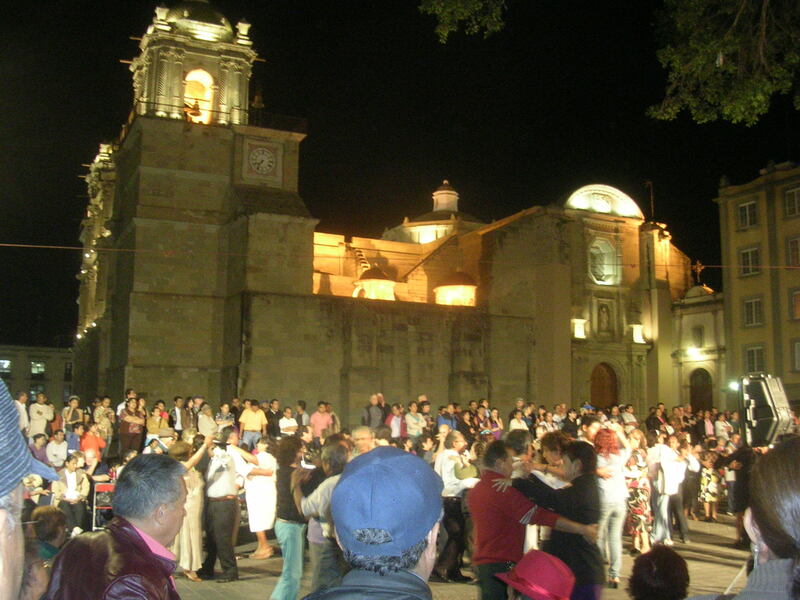 I imagine that because we visited in January, it was an unusually dry spell, because Oaxaca is well known for its rich culture. 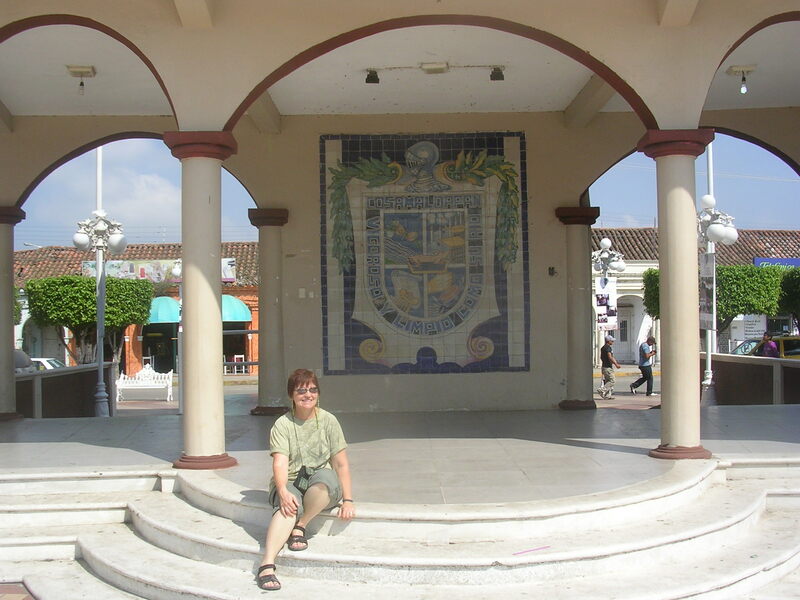 We really enjoyed our time in Oaxaca city. I had heard a lot about it and was excited to experience the rich multicultural ambiance. But I went with expectations and that is always a mistake. It is a wonderful place and I will definitely return. But next time I will leave my preconceptions at home and experience it with an open mind and heart! 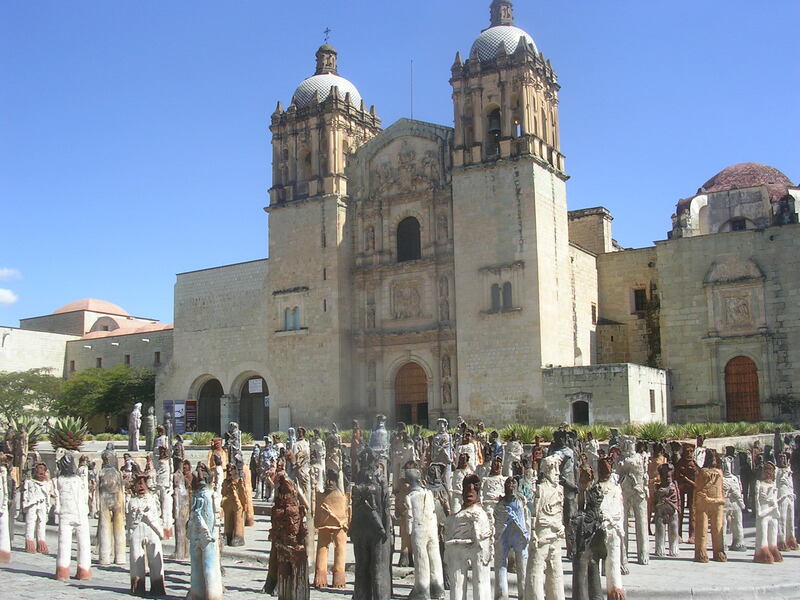 A display of 2501 clay figures representing the people who left one small town in Oaxaca and went to the US. The rough sad images illustrate the hard life many encounter there. And some good old fashioned FUN! A Small town – where? Sounds a bit like Quesnel, doesn’t it? 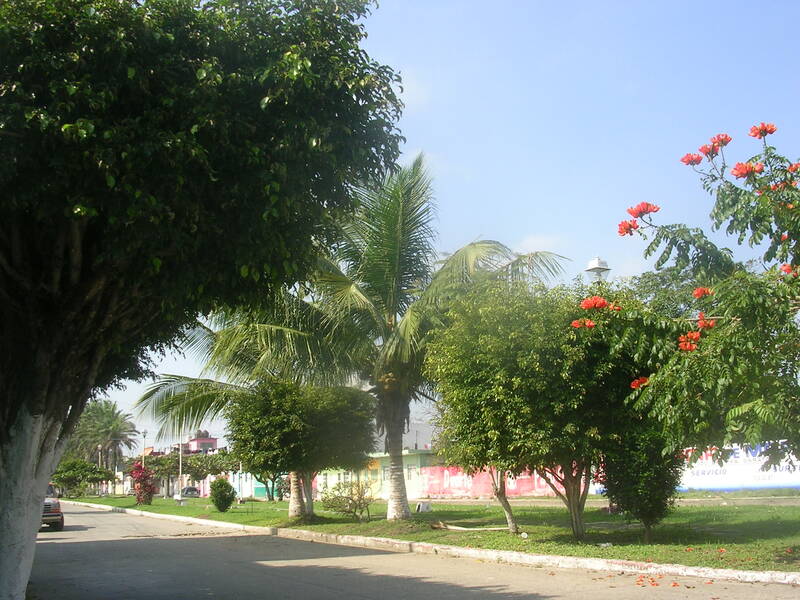 But deep in the heart of Veracruz, on the banks of the Papaloapan River, lies the town of Cosamaloapan. 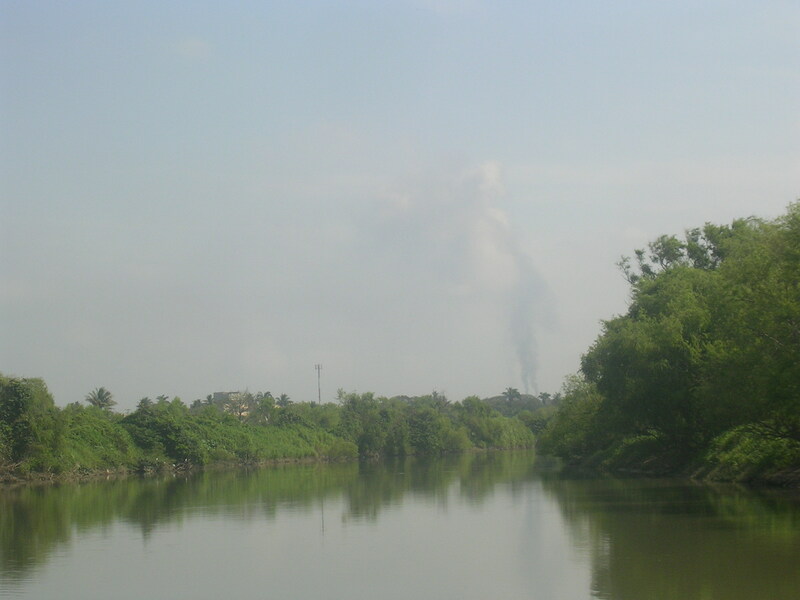 Surrounded by dense forests of sugar cane, the refineries chug away converting the raw stalks into sugar. 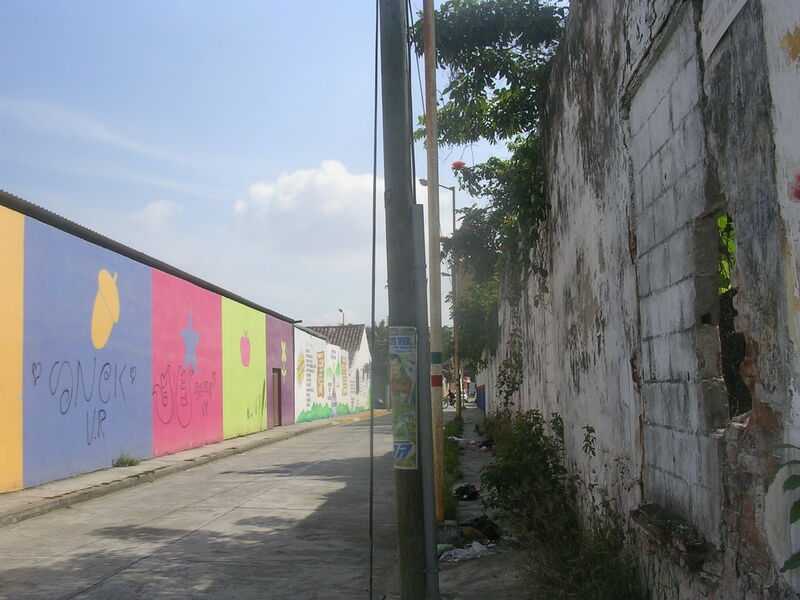 This is a typical Mexican town. It is hours away from the ocean, there are no archaeological sites nearby and no tourists. People turn and stare at me and I’m not even blond! 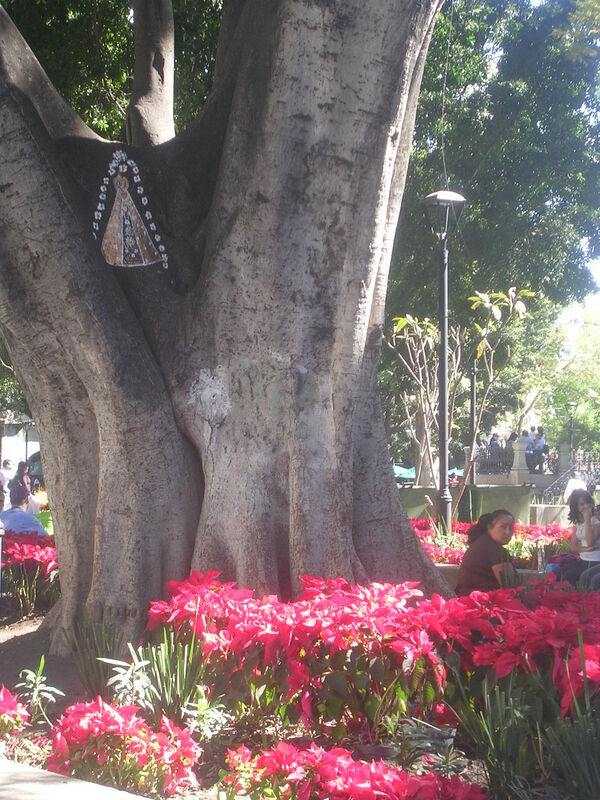 Cosamaloapan is a traditional town, not just Vilo’s birthplace, but that of his grandmother’s grandmother’s grandmother…. back until the beginning of time… Everyone is related, if not by blood, then by generations of friendship. And nearly everyone lives within a block of where they were born. The climate is very hot & humid. It is often in the 40s in the summer and a cold damp day in the winter may drop down to 20 degrees Celsius. Everyone wears coats and talks about the cold weather from the north. During the rainy season, the river often overflows its banks and floods the town. Weather is a constant conversation theme. It is the same as in Canada, if we aren’t complaining about the cold, we are complaining about the heat! There are visually many contrasts – There are brightly coloured houses with flowery gardens with swaying palm trees and bougainvillea flowing over high rock walls. Interspersed with these are old abandoned shells surrounded by patios that used to ring with laughter, but now are covered with moss, the yards full of weeds and garbage. Going for a walk is an interesting proposition. You have to wait until almost nightfall to avoid the sweltering heat. Of if you go in the morning there is a heavy wet fog hanging over. One day we went around the block to stretch our legs and passed a tarantula spider walking down the sidewalk – seemingly with same attitude as a dog, confident in his right to be there. I almost had a heart attack on the spot. A man with a broom soon put an end to his airs. As an almost-arachnophobiac, I couldn’t really feel too sorry for it. Everyone is busy working in or out of the home. Preparing meals takes most of the day. Food is an extremely important part of the culture. And they eat a lot of weird things, in my humble opinion. As a special treat for an honoured guest, my sister was served a fish head with herbs and salsa wrapped in aluminum foil. When she opened it, she screamed! 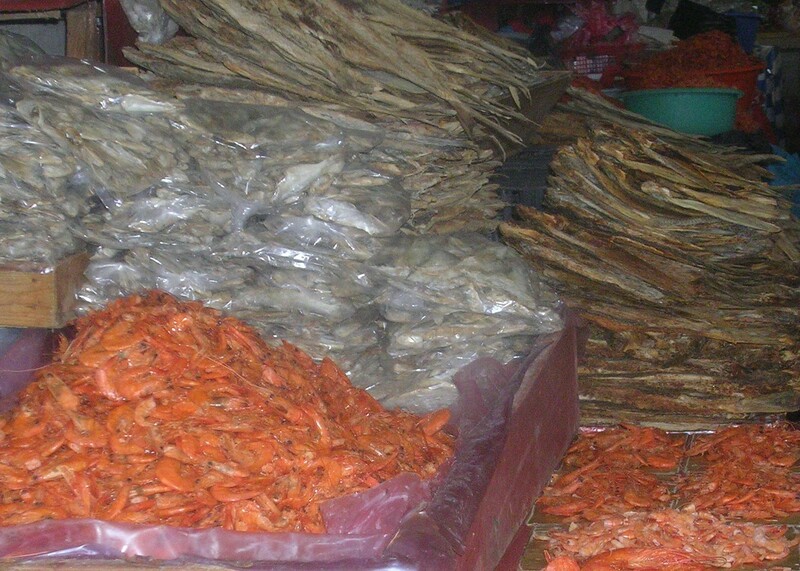 They eat everything here – and I am too squeamish to try most of it. Who wants to eat tacos made of eyeballs, ears, cheeks, stomach, colon, yuk… I’ll have fried chicken, thank you very much, and don’t give me the feet! 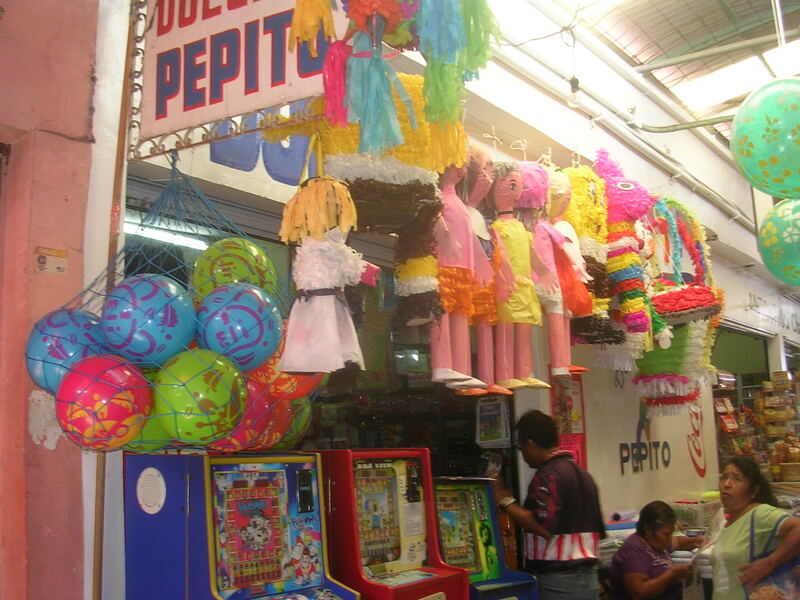 In Mexico, the market is the heart of the city – or more apt – the guts of the city. 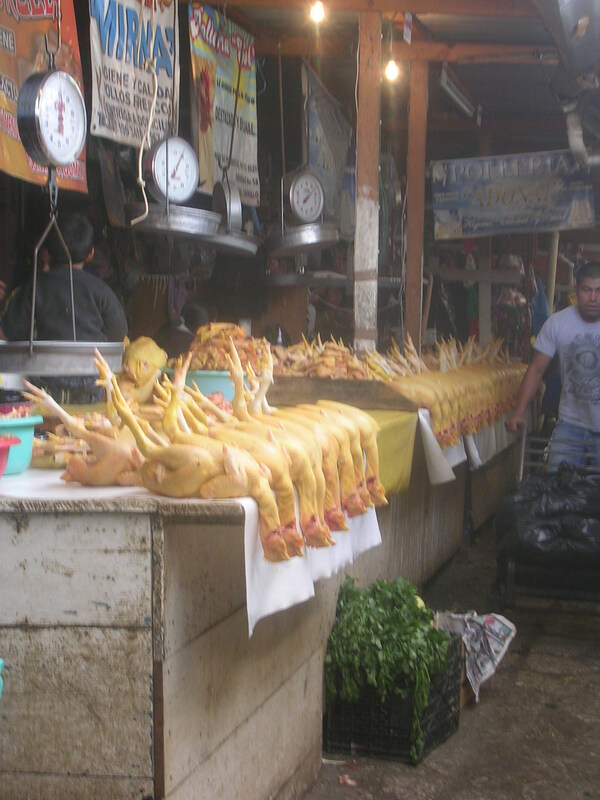 While choosing some freshly picked bananas for breakfast, I had the strange feeling of being watched – I turned around and there was a huge pig head hanging on a giant hook, swaying back and forth, catching every movement I made. The noise level is almost unbearable at times. Every little business has their speakers outside turned to full volume. And they don’t sell earplugs! There are Volkswagen bugs driving around town with huge loudspeakers on top announcing the latest specials and events, and sometimes even the obituaries! 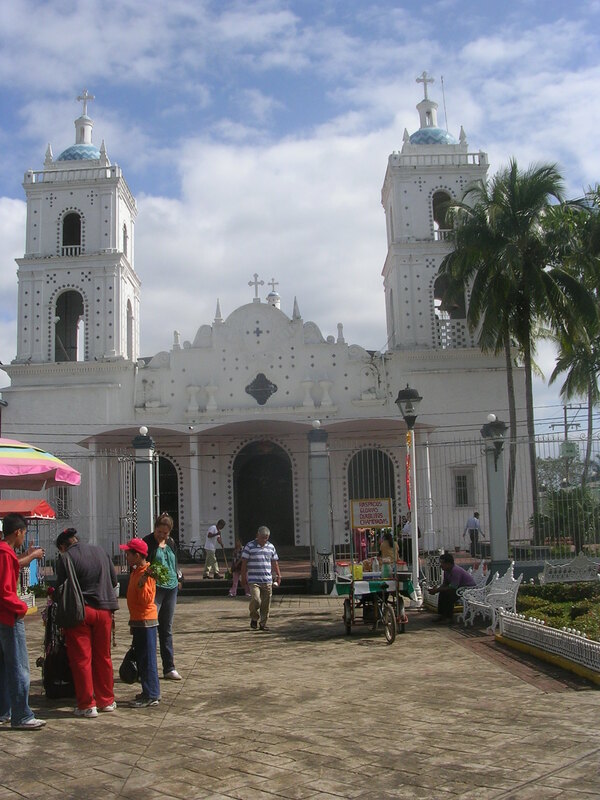 Every town has a main square, situated in front of a Catholic church. 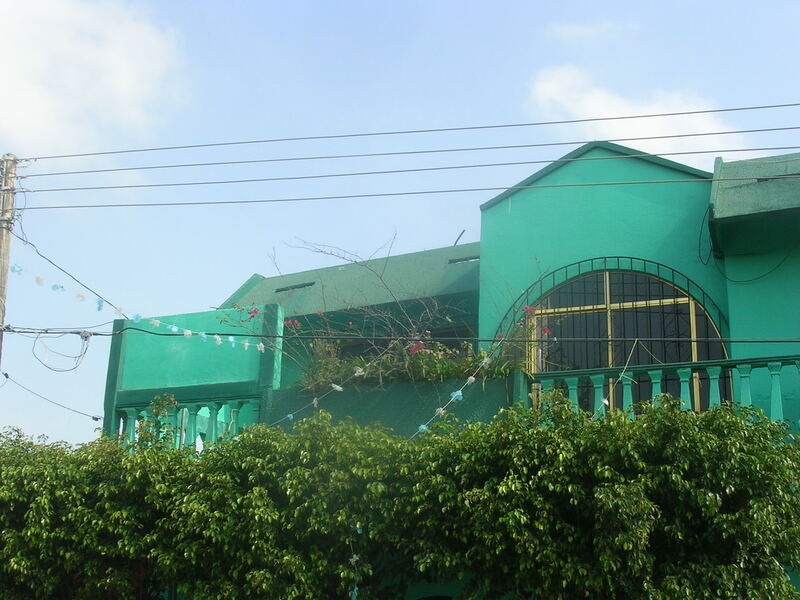 This is where families gather, young people flirt and dramas act out. 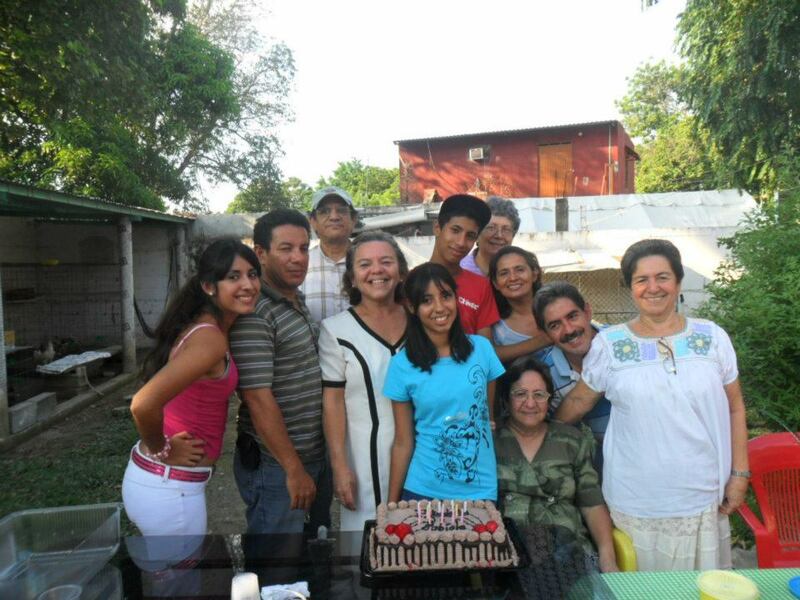 Family is the number one priority. The favourite thing to do is get everyone together and eat and eat and eat… Music is a very important ingredient to every gathering. Almost everyone here plays an instrument and sings. Although the town sometimes appears boring from the outside, inside the houses are families interacting – without having to make an appointment first – and really enjoying each other. Last night our 10 year old niece dropped in to visit us, and she made us dinner! Immersed in a happy culture like this one, you have to feel good about life! Suddenly the explosions started and we all moved back startled. There were a few screams and then laughter. The ‘Viejo’ was burning! Adios 2011! 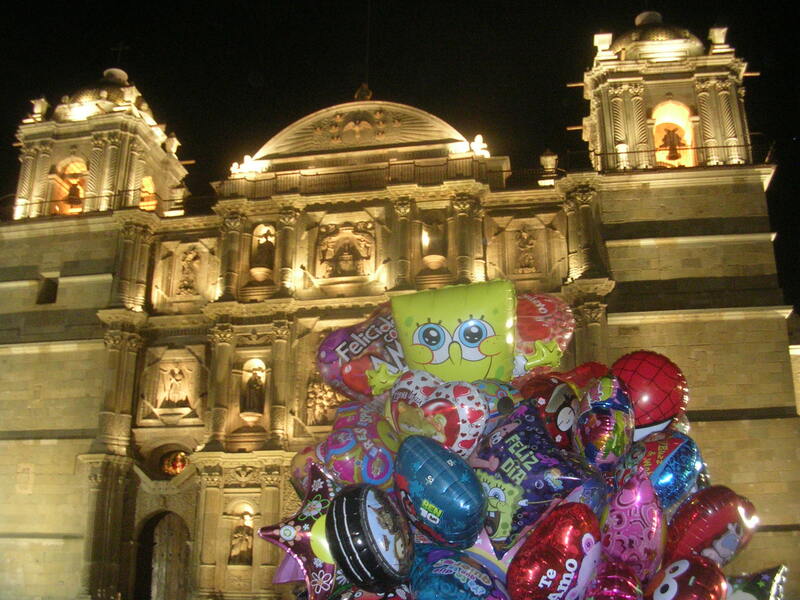 In Veracruz the end of the year is celebrated with a party (of course!) 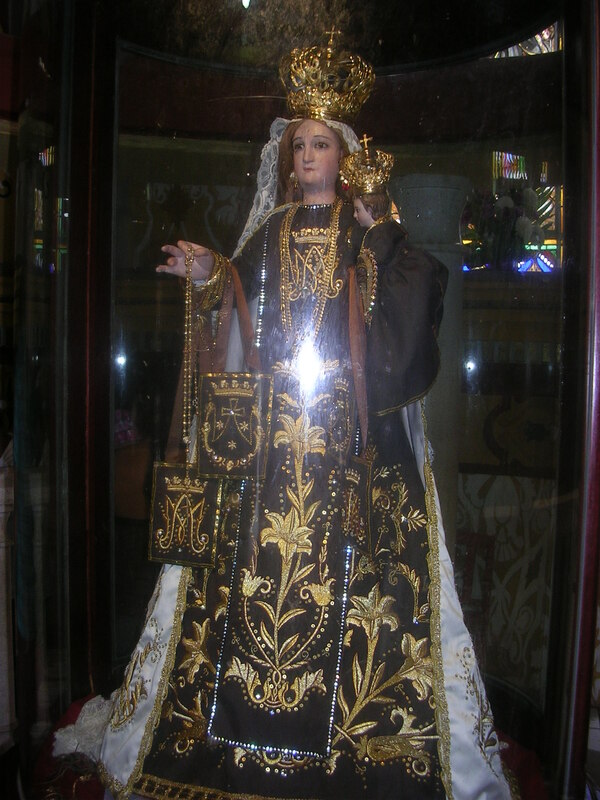 that includes a very interesting tradition that has been carried out for many generations. This year I was fortunate enough to share in the festivities. 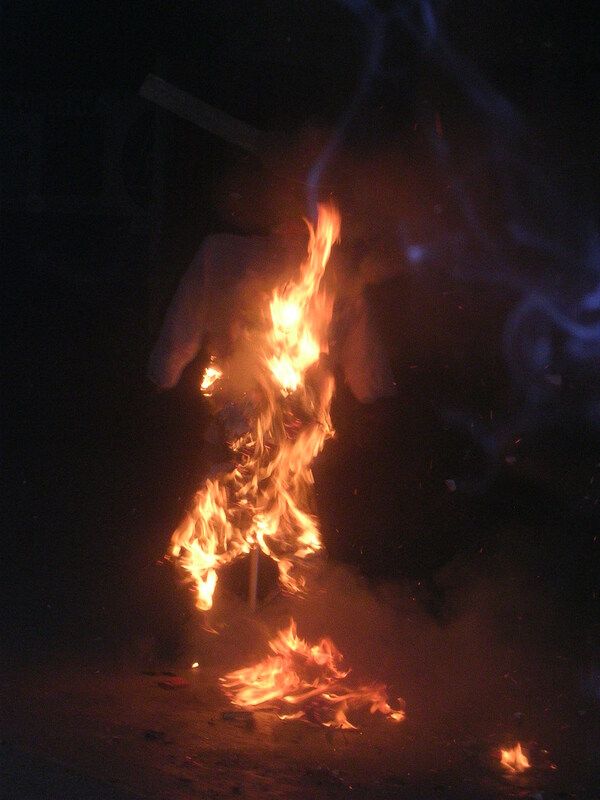 The tradition involves saying goodbye to the old year and welcoming in the new one. 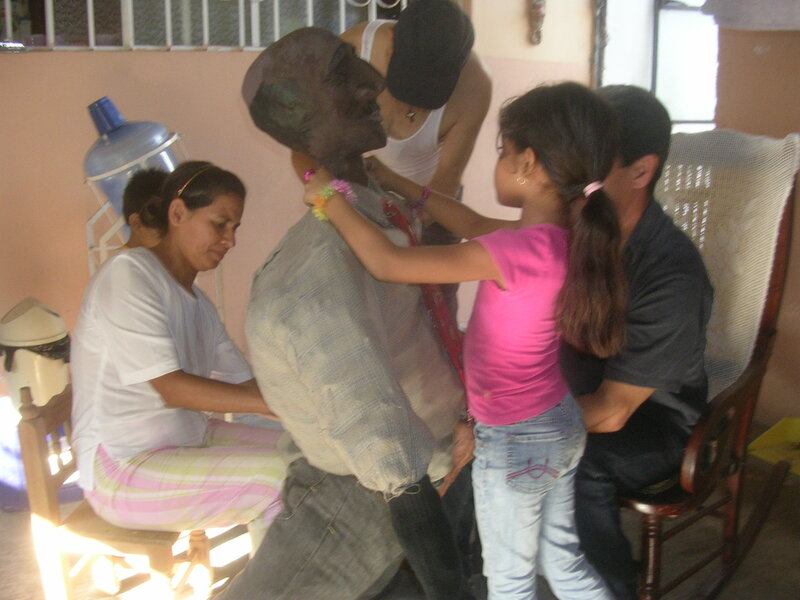 This is done by making an ‘effigy’ of Don Farruko, affectionately known as ‘el Viejo’, the old man. 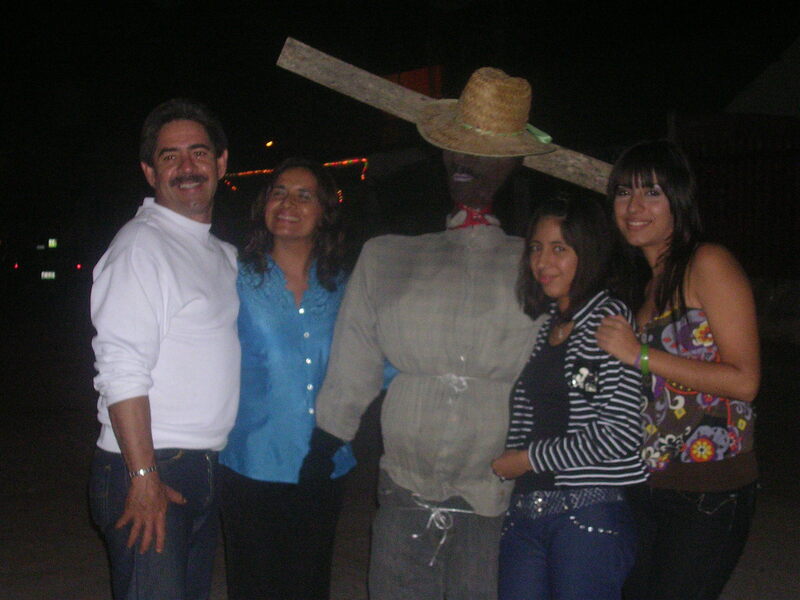 He is a life size scarecrow-like figure that represents the passing year. On the front porches of the houses the families set out an extra chair to display their creations. There is a song that everyone sings about the viejo. It doesn’t translate really well, but I’ll try…Alms for this poor old man, he has left a son for the New Year. Here is Don Farruko, he is dying of laughter, because at midnight, he will return to ashes… More verses are invented at the time but most aren’t fit for publication! 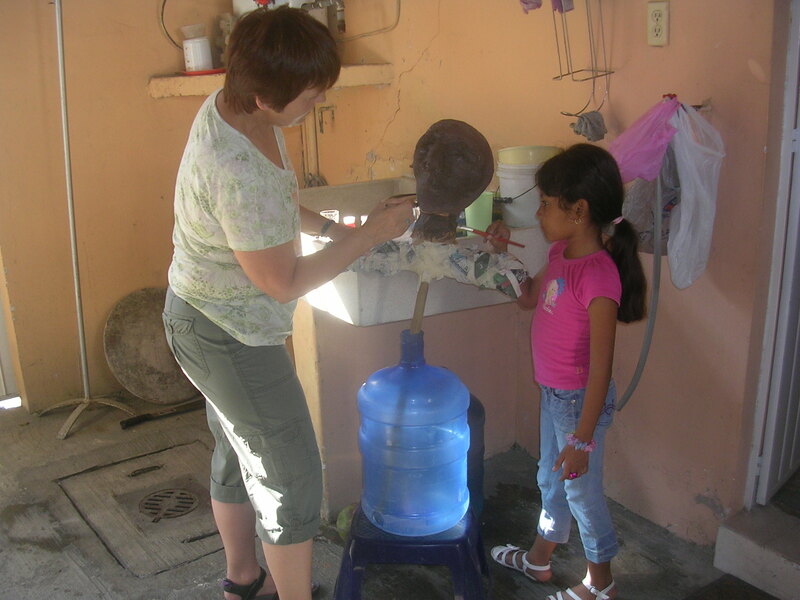 Since I love doing paper mache, I was nominated to make the head of the ‘Viejo’. I formed it completely out of paper. One of our little nieces helped out. When the head was ready, the rest of the family took over and made the body. 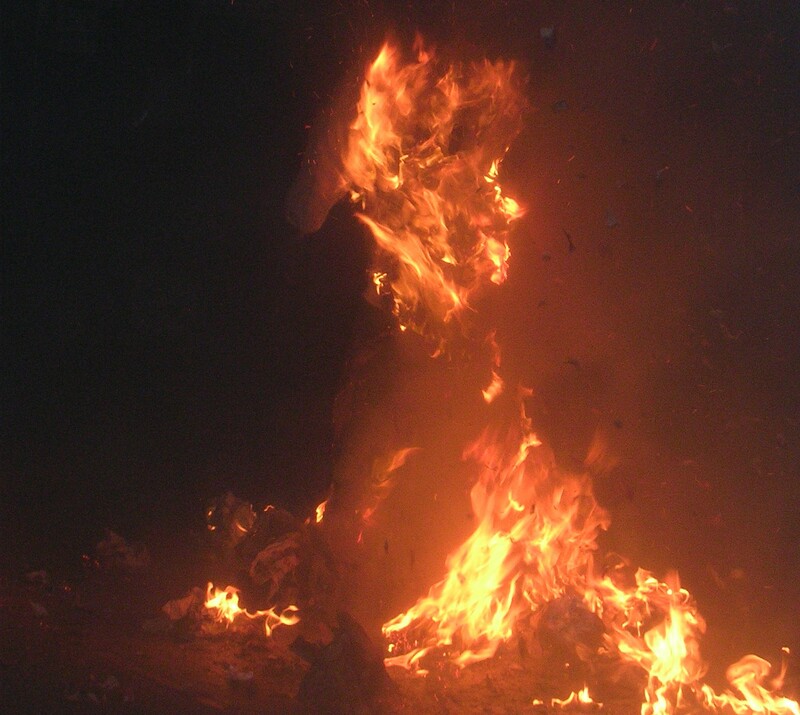 They stuffed a shirt & pants with paper – and FIRECRACKERS – to create an old man. 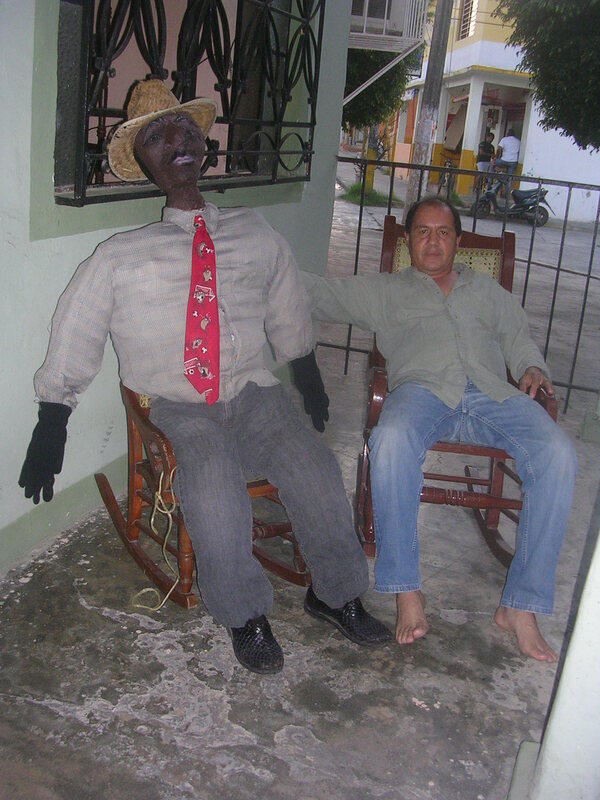 When he was ready, we proudly put him outside to sit on a chair and interact with the passers-by. As the hour of midnight drew close, we propped up Don Farruko in the middle of the road. The neighbours were doing the same. 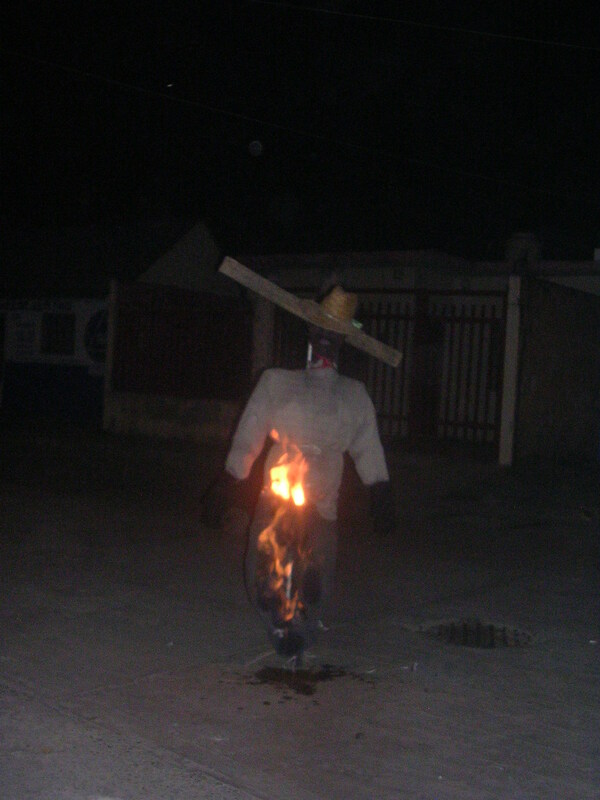 With a little gasoline and a match, suddenly the Viejo burst into flames. As the fire reached the many firecrackers, explosions started and body parts flew in all directions. We later found an arm of someone else’s old man in the ashes with our guy! We had chosen the cutest little girl to collect money from the family for the firecrackers. She did such a great job that we almost exploded the neighbourhood! 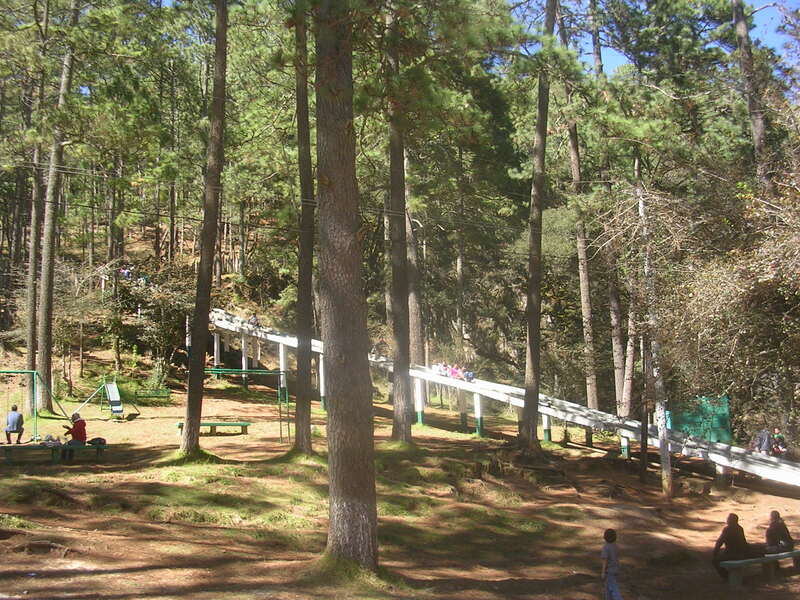 The nature park in the midst of a forest 10 kilometres from San Cristobal de las Casas is a wonderful place to explore. With all the pine trees, it smells like Christmas. 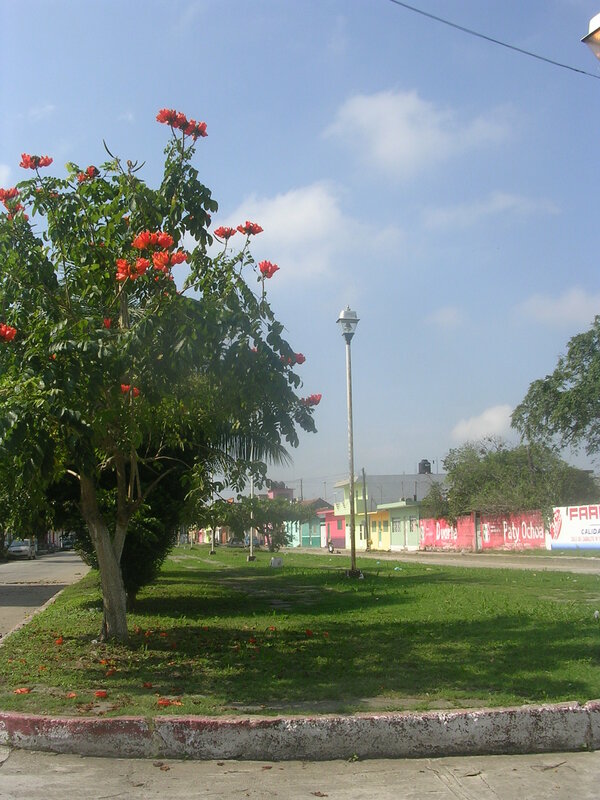 Entering this park you hear happy voices ringing out and see many families playing and relaxing together. 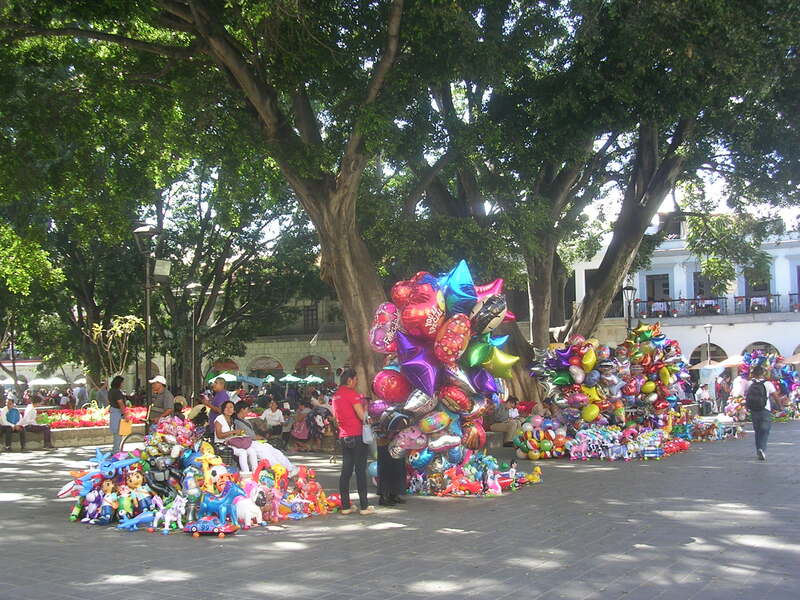 There are horses you can ride and a big slide, as well as many souvenir and food stands. 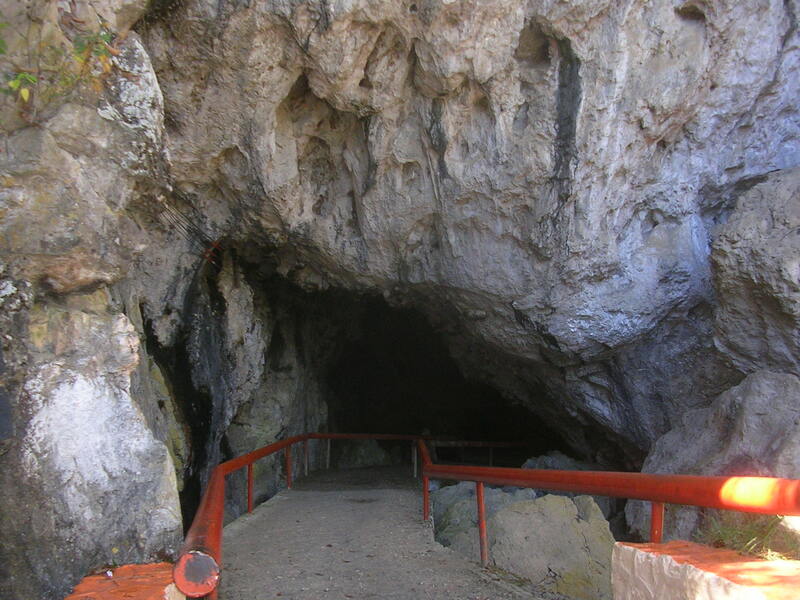 But the real excitement comes when you arrive at the entrance of the Grutas de Rancho Nuevo.This is an incredible cave that enters deep into the earth. There is a lit sidewalk that goes for 750 metres inside the cavern. There is a high ’ceiling’ and is fairly wide, so you don’t feel closed in. 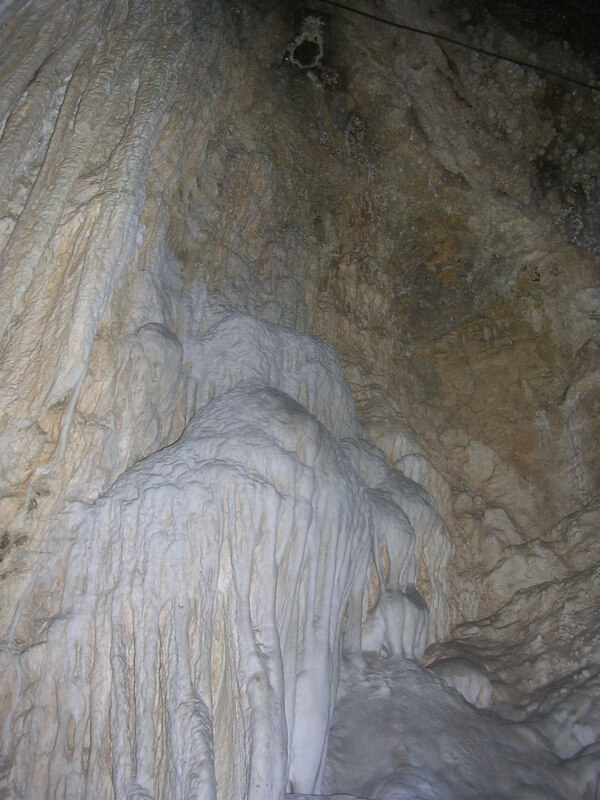 The grand stalactites and stalagmites form eerily beautiful sculptures. And the colours inside the cave are surprising. I expected grey and grey, but there are pinks, greens, blues and yellows. Under the lights, it’s like a rainbow is in there. 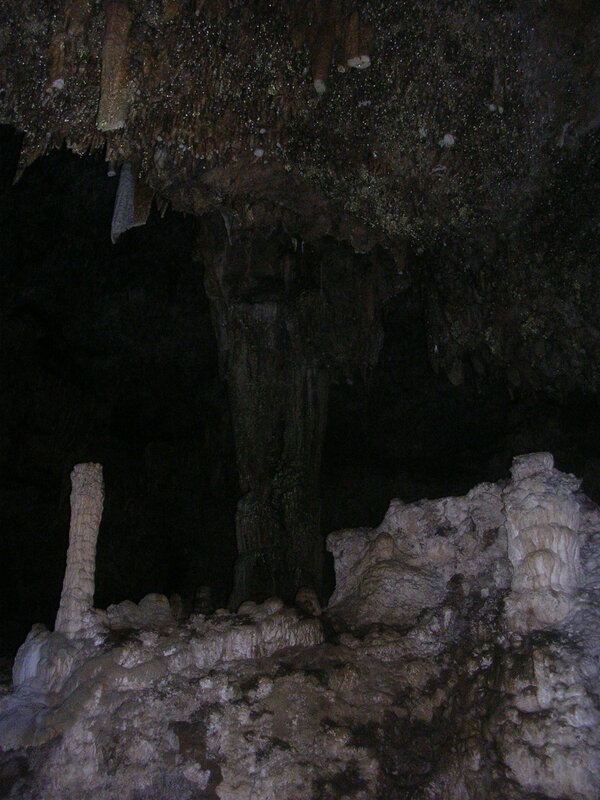 This cave was discovered in the mid 1940s and became a passion of one man. He explored it for over 50 years, taking many interesting pictures along the way, which are exhibited in the onsite museum. As of today, they have explored 10 kilometres and still haven’t reached the end or any exit. But the air is fresh inside, not dank, so it seems like there is fresh air entering from somewhere. I picture another entrance in a magical place like Misol-Ha. I can imagine the Mayans going through this ‘natural tunnel’ and ending in a sacred place where they would perform their mysterious rituals and ceremonies. Where do I start? With the aquamarine water flowing serenely over smoothly molded rocks like topping over an ice-cream sundae? With the vibrant pulse of water cascading 30 metres over my head? 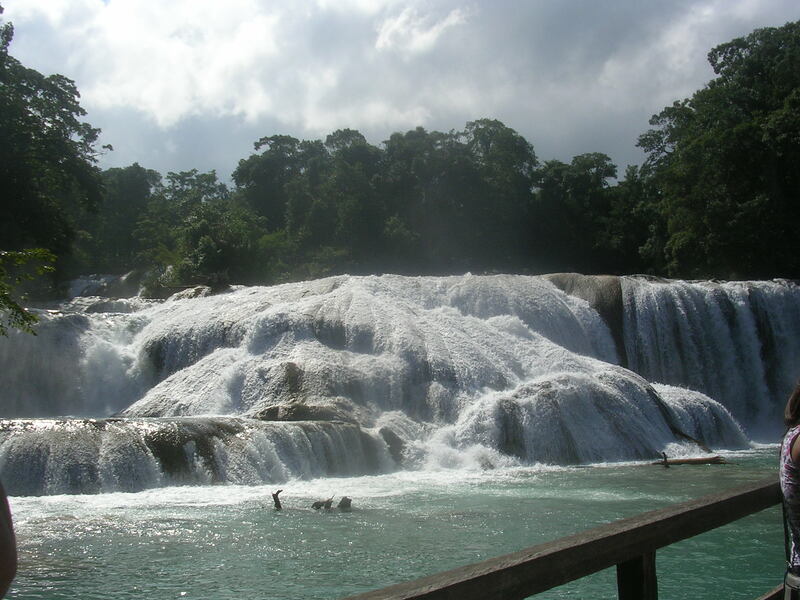 Or with the startling beauty of Palenque? The day started with an exciting drive through a switch backed, speed bump covered narrow mountain road. We passed through isolated mountain towns where people still turn to see who is passing by. The villages here are predominantly indigenous and we saw the clothing change to brightly embroidered cotton blouses topped with satin capes. They also use these capes as aprons. Pretty clever, huh? I wonder if this ever occurred to Superman? Over three hours we dropped 2000 metres. Instead of pine forests and corn fields, we were surrounded by banana trees and sugar cane. We stripped off a few layers of clothing and began to sweat. This was a treat after listening to our teeth chatter in the cold morning in San Cristobal. 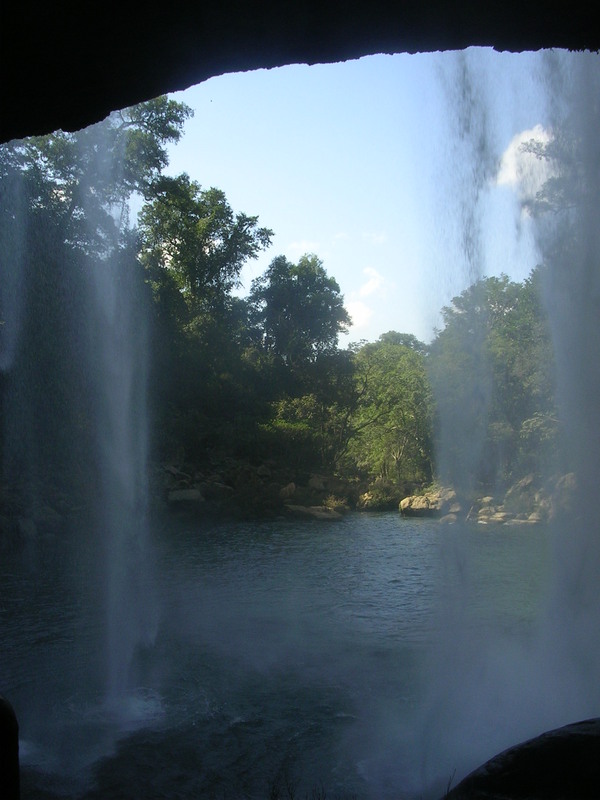 Our first stop was Agua Azul. This is the site of a river that is the most unbelievable colour of aquamarine. As if the colour isn’t amazing enough, the river falls over huge worn boulders creating the most wonderful waterfalls. Usually when I think of waterfalls, words like powerful, crashing, force, come into my mind. But here I thought of soft, gentle, serene, and calm. It appeared like a layer cake with yummy frosting running down the sides! I had the overwhelming urge to take off my shoes and feel the water between my toes – so I did. It felt like it looked and it was very soothing. 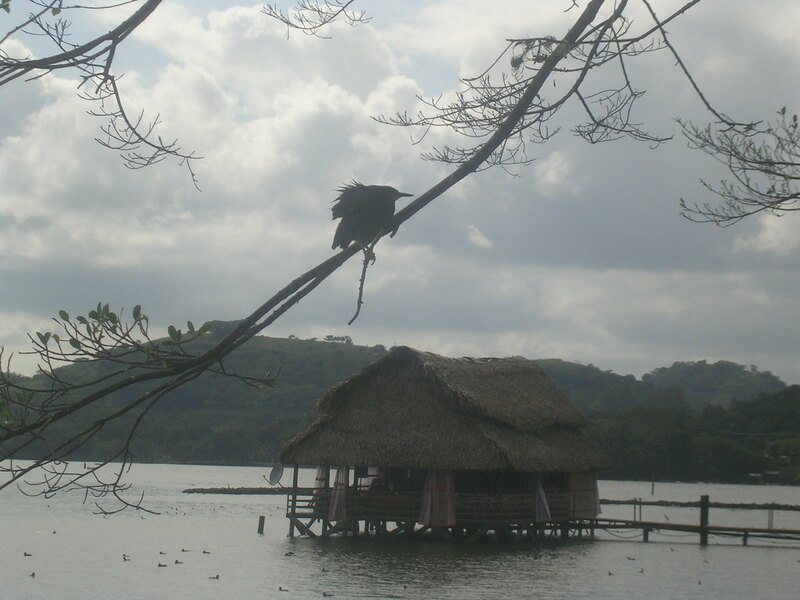 From here we continued on to Misol-Ha. I had never heard of this place, except that there was a waterfall there. I had no expectations, only that I thought I’d see something ‘pretty’. Well, this waterfall took my breath away! After walking only about 100 metres from the parking lot I was transported into a magical world where Mother Nature is both King and Queen! Like most waterfalls, there is a huge rock wall with water cascading over it, but here the rock face is concave, almost in the shape of a C, so that you can walk behind the waterfall and feel part of it. There are caves burrowing into the wall. This marvel is surrounded by dense jungle smelling rich and pungent. Huge exotic rainforest trees such as mahogany and teak tower over. For the first time in my life, I swung on a ‘natural’ rope like Tarzan swung on! The energy here is incredible. It is alive with the memories of sacred rituals of the ancestors. I had the overwhelming desire to create my own and just stay there. 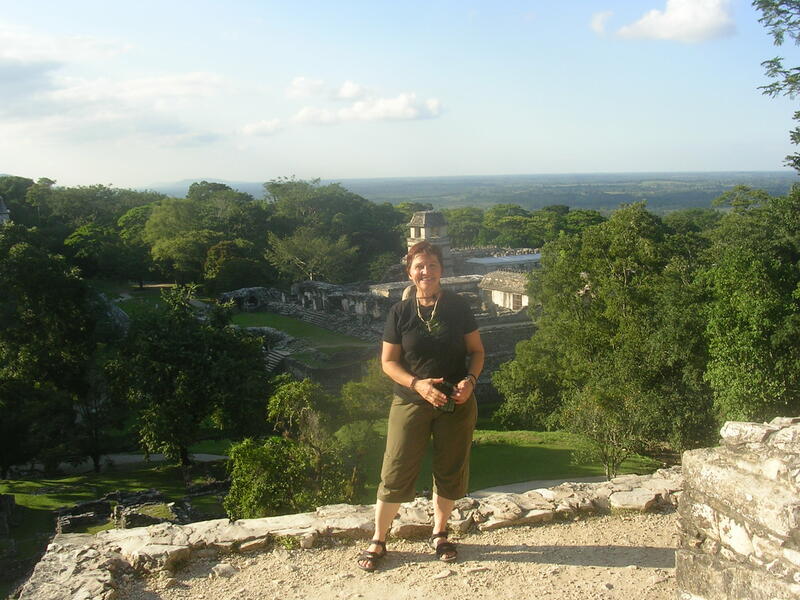 Palenque is an archaeological site that has always piqued my interest. Because it was hidden in the jungle, but also because it remained hidden for so long. I expected to feel a gut wrenching ‘wow’ at the first glimpse of the pyramids nestled in the wild dense brush. And this is exactly how I felt. The setting is so beautiful, that the pyramids and ruins are icing on the cake. What I didn’t expect to feel was the complete absence of energy there. This site is abandoned, even the ghosts are gone. It was interesting to see, but I enjoyed being in the jungle more than exploring the archaeological site. This is what I love most about travelling, there are always surprises. Now that I travel using all my senses instead of just sight, everything is an adventure. Coming home through the dark mountain road the sky was magnificent. I saw constellations that I have never seen before. I felt like I could reach out a grab a star for a souvenir!